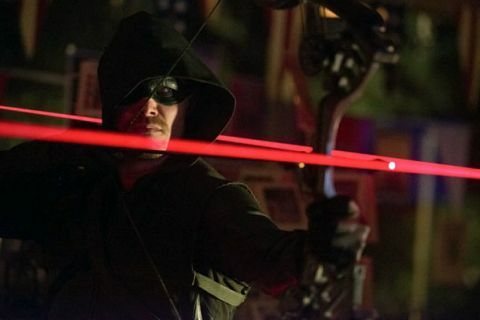 THE VERDICT: For all the explosive potential of its title and subject matter, Arrow ’s post-hiatus comeback episode is more fizzing firecracker than full-on demolition job, more sputter than ka-boom. It doesn’t help that the villain is such a blank. The comic book version of Shrapnel has some pizzazz but his TV counterpart strips away the fantastical edges of the character to leave us with a generic “mad bomber”, his motivation little more than a Travis Bickle style soliloquy in a parked car. Elsewhere “Blast Radius” fumbles some crucial action beats: Oliver’s escape from a room criss-crossed with lasers (a cool visual) feels flat, never quite conjuring the nail-chewing tension of the arrow needing to hit the target – imagine it recut with more close-ups of Oliver’s sweat-drenched face, his fingers on the taut bowstring, callibrating the perfect moment to shoot… His final confrontation with Shrapnel is equally perfunctory. Other potentially effective moments are weirdly tossed away – Diggle’s shot at point blank range but it’s a wound with no real dramatic consequence. And while it’s good that the writers are clearly finding a reason for Laurel’s continued presence on the show, playing up her investigative nature, her scenes with Sebastian Blood drag. There are glimmers of good stuff, though. The motorbike chase on the freeway injects some much-needed adrenalin and director Rob Hardy has a knack for the underplayed moment of cool: I liked Oliver hearing the police message and quietly, instinctively, plucking his bow from the rack, responding to the emergency with professional efficiency. A tiny moment, but telling. TRIVIA: The creation of Erik Larsen, Shrapnel debuted in Doom Patrol Vol 2 No 7, back in 1988. A member of the Secret Society Of Supervillains, the comic book incarnation of Mark Scheffer is considerably more outlandish than the screen version. A mutated human whose body is composed of thousands of fragments of metal, he has the power to project these scraps in explosive blasts – and he’s also known to slurp up the blood of his victims. DID YOU SPOT? : Lance’s call sign is DC-52, a pretty on-the-nose reference to DC’s New 52 initiative that revamped their entire comics line in 2011.